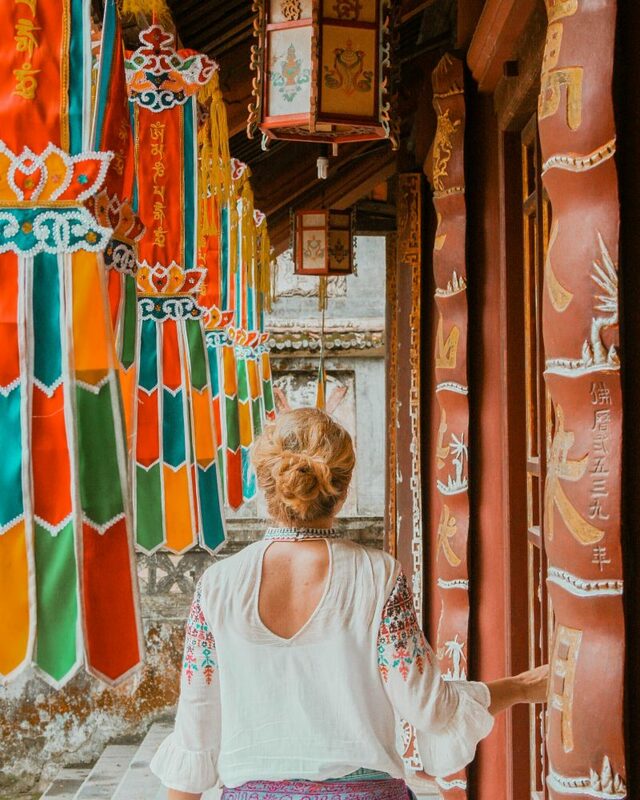 I had been living in Hanoi for three months teaching English when I saw some pictures on social media of large temples and stone archways nestled high in the mountains. It was tagged as the Perfume Pagoda (or Chua Huong and Huong Pagoda). I asked around my workplace but many of the other teachers had not been, many said that they had heard it was a beautiful place. I started to do some research, there was not a ton of information on the internet about it, so I decided it was something I had to see for myself. I knew that going on a big tour wasn’t right for me so I connected with Inspitrip to get the ball rolling on this adventure! I first heard about Inspitrip though a friend who wrote and been collaborating with them, I got in contact with my local insider through their website! The morning of our trip David picked my boyfriend and me up from our home in Hanoi. 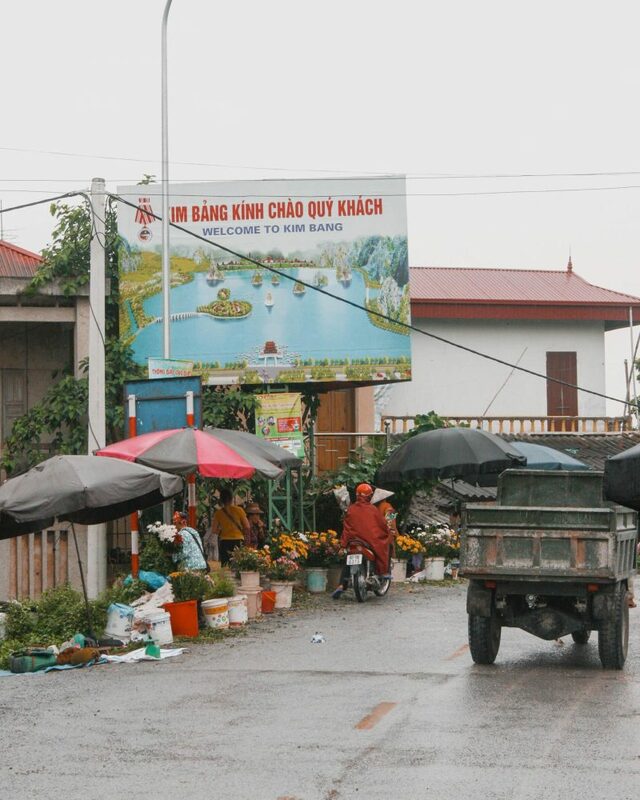 We then started the drive out to the Huong Tich mountains. Along the way we chatted about life in Vietnam, David shared with us many different interesting facts about Vietnam, like some of the differences between societies in the north and south, their different attitudes towards jobs and living, and we shared information about our home countries too. He was extremely personable and friendly, the conversation flowed effortlessly! David was a super friendly and knowledgable person. 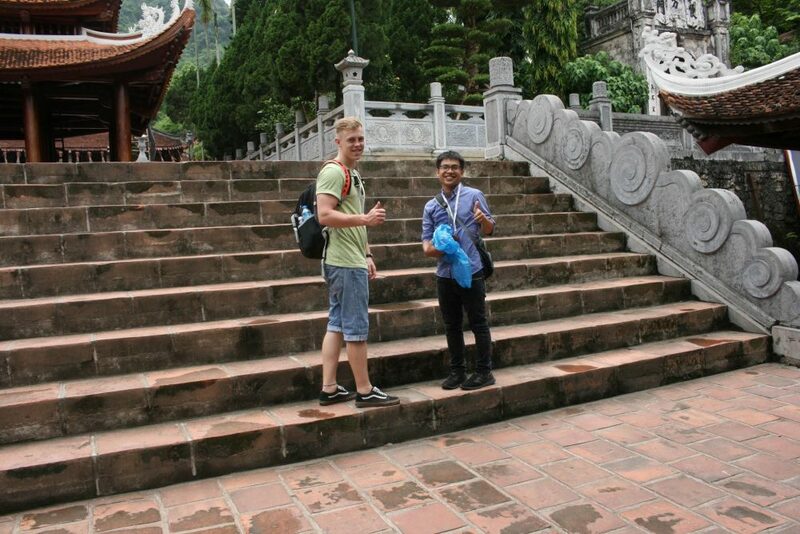 He shared lots of interesting stories about Perfume Pagoda history and Vietnamese culture. The conversations with him was always effortless. About two hours and some heavy traffic later we made a short stop at a local fruit market. Here David explained to us what the different fruits were and helped buy us some. 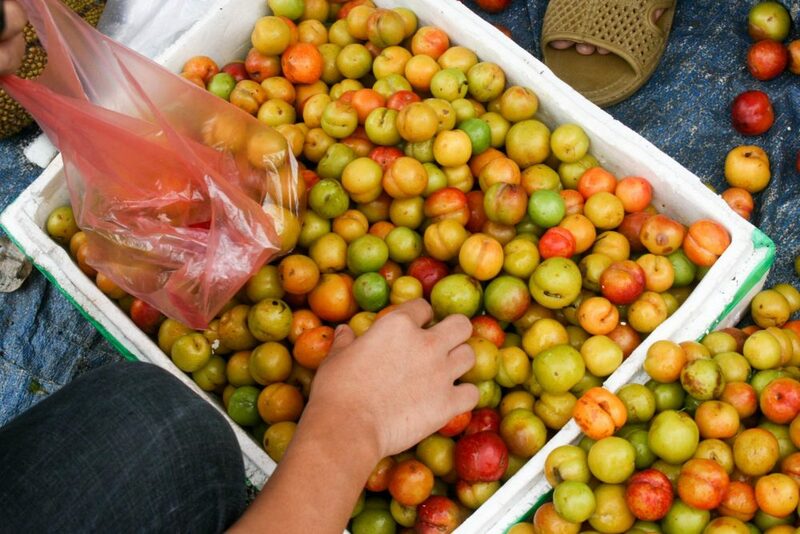 We opted for some Vietnamese plums, as my boyfriend and I both had never tried any. They were delicious but sour!!! 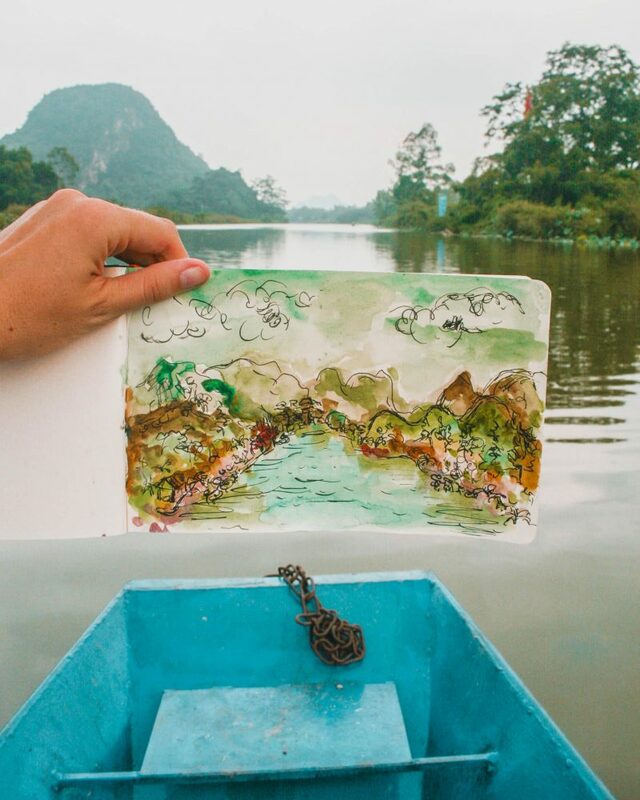 On the drive out of Hanoi we saw many different beautiful sights! I loved the expansive rice paddies and large towering mountains. We ran into a bit of traffic due to an accident but other than that, the ride was smooth and the car was very comfortable. When we made it to the start of our tour it was very quiet, because of our early start we had beaten the crowds and large tour buses. We stopped and bought an umbrella and our boat tickets, then we were off. The three of us sat in the small little boat along with our rower and meandered down the river. David explained to us that the different women who row the passengers up to the base of the mountain are either very poor or have lost a family member in the war. During the boat ride, we had chance to admire the epic natural scenes while listen to the emotional stories of females who do boat rowing for daily earnings. 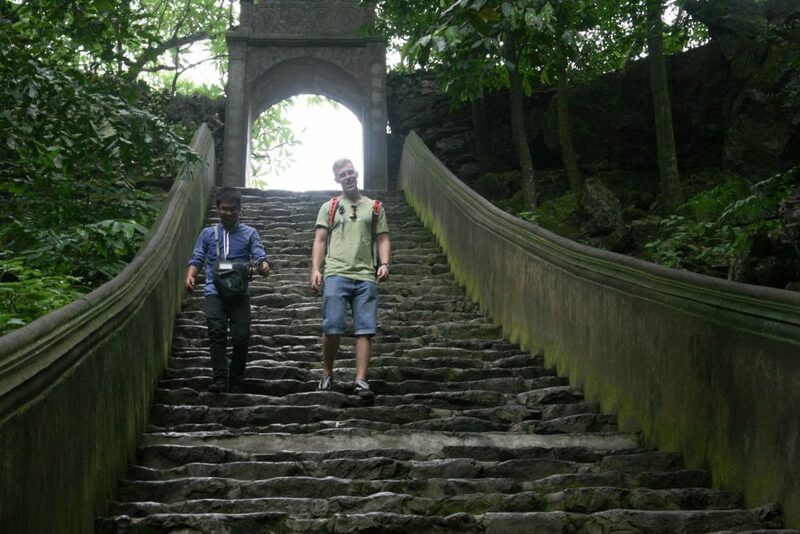 Along the way, David told us interesting facts about the jungle and different legends that accompany them. He relayed questions to our rower and helped bridge the language barrier! It’s summer, so it’s the lotus blooming time. I couldn’t help myself picking one. 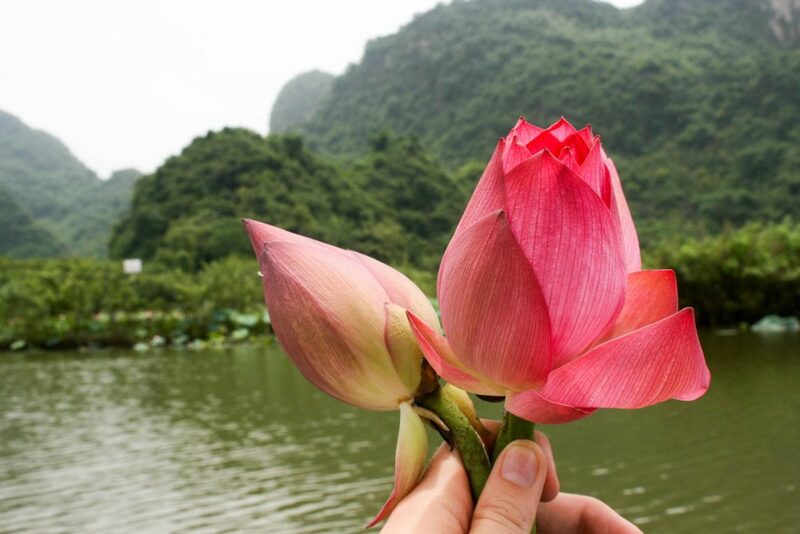 Because it was summer time there were tons of lotus flowers blooming on either side of the river. Although it was very hot, it was truly magical – all of the beautiful flowers and then the large jungled mountains. We felt very at peace, as it was quiet and there were no other boats around us. The sounds of the jungle were the only noise along with some light rain from time to time. After around an hour, we docked the boat and had some lunch. The food was delicious but a tad pricey, but that is what we expected. I had a cold coconut which was amazing, just what was needed after being in the sun for so long. Here there was a temple complex where many different pagodas were. David took us through the Thien Tru Pagodas explaining what each one was and answering all our questions along the way. They were stunning, the large gates and different shrines all were very old, you could feel the history! 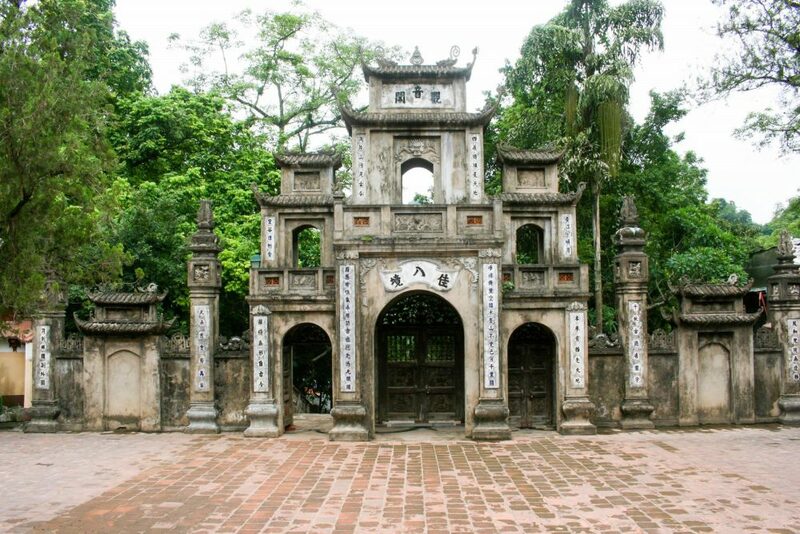 The Tien Tru Pagoda complex was gorgeous, the architecture was a combination of Chinese and Vietnamese styles. We walked through each one quietly, taking in all of the different ornate decoration. There were different temples devoted to different beliefs. Overall it was a Buddhist complex but there was a pagoda dedicated to Vietnamese folk traditions as well. David explained to us why each pagoda has a foot high barrier at the doorway, this is because people believe that ghosts have no legs, therefore, cannot step over the barrier – thus keeping them out of the temple. They didn’t allow photography on the inside, but the shrines were gilded with gold, and overflowing with fruit and flowers. After wandering around the temple complex we made our way to the cable car and were hoisted up, up, and away. 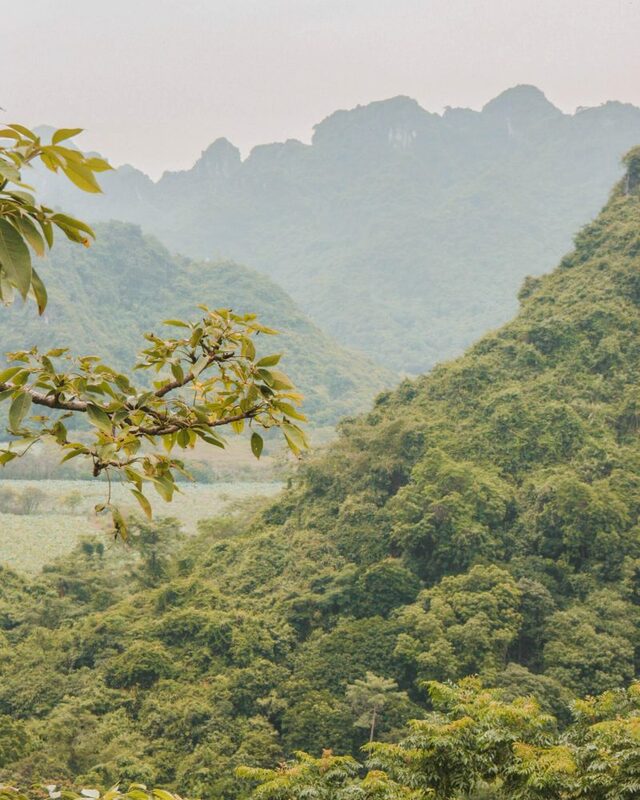 Cruising over the lush jungle, it looked as if there was an enormous green blanket draped over the peaks. Below you could see the pathway that people would take if they were walking up, little stalls lined the path, but with it being the low season none were open. David explained that there is a huge religious festival that is held where people from all over Vietnam make a pilgrimage up to the cave. 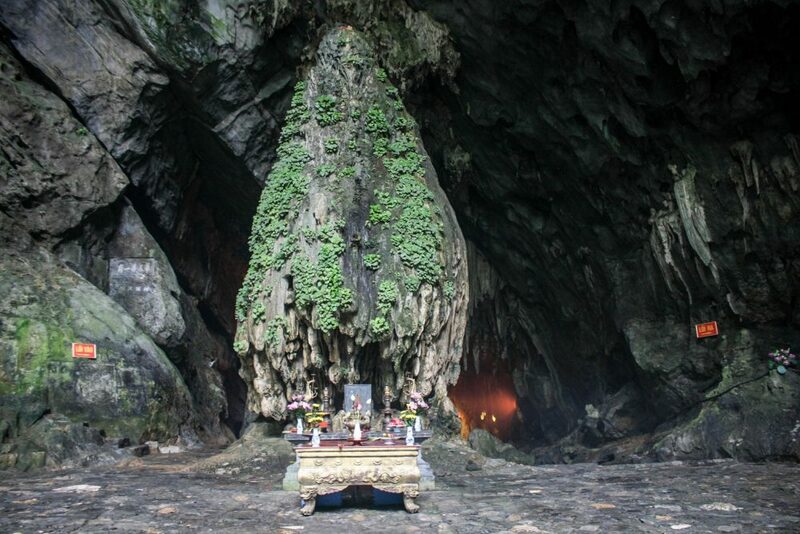 The Perfume Pagoda temple – also known as Chua Trong (meaning Inner Temple) is situated in a large cave. Descending into the cave via many stairs. 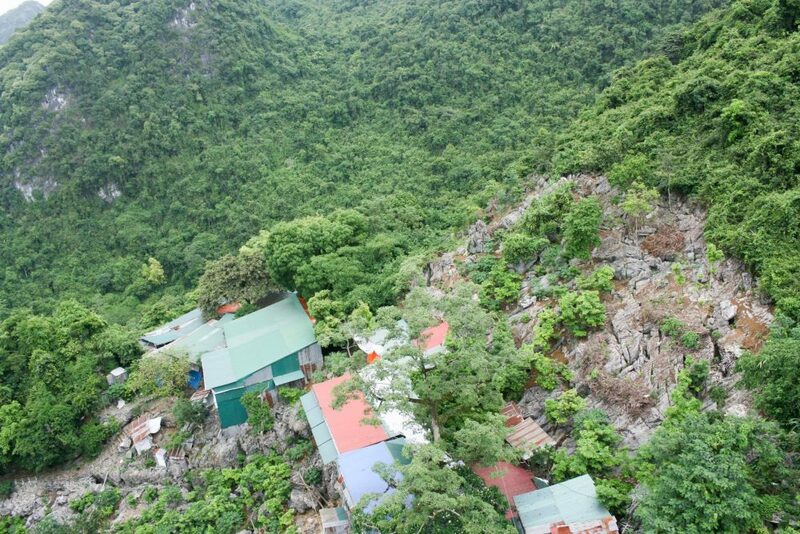 After ten minutes, you step off the cable car and are welcomed by an astounding view. There are mountains as far as you can see. You then will descend into the cave via many stairs. We walked through the cave and the stalagmites and stalactites were astonishingly big. The whole cave was remarkable. There was a series of different shrines where people paid their respects and gave offerings. The view looking out of the cave was just as beautiful. The tall jungle trees towered all around you and everything was incredibly green. After a good amount of time, we started our journey back. On the way back we were starting to get a bit tired, so a little rest stop before getting on the cable car was necessary. We refuelled with some water and a snack at one of the stands near the cave, then we started to head back homeward. The Perfume Pagoda really is a marvel deep within the mountains, definitely, worths a visit! Our same rower was waiting for us at the bottom of the mountain, and we meandered down the river again. The sun was starting to go down, and we were only one of a few boats on the river. We reflected on all the new information that we learned, the Perfume Pagoda really is a marvel deep within the mountains. 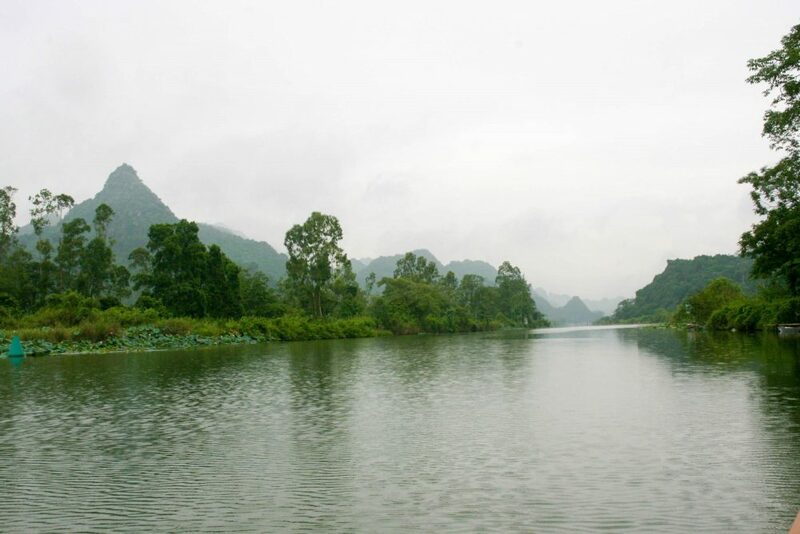 From the towering trees, forested jungle and peaceful rivers, this day trip was one we won’t forget for a long time! If you have enough time it’s most definitely worth a visit! Written by Kelsey Lynn on 26th July 2017. 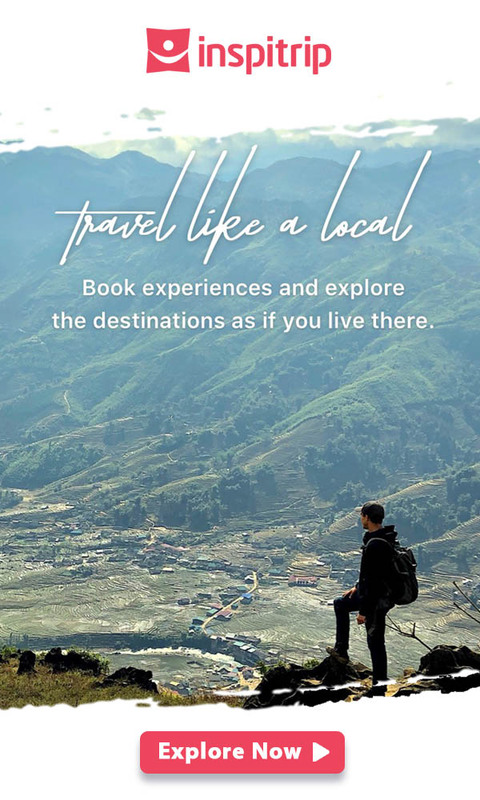 The article is part of Inspitrip’s local series in which we caught up with travellers and encouraged them to share their stories with our readers. 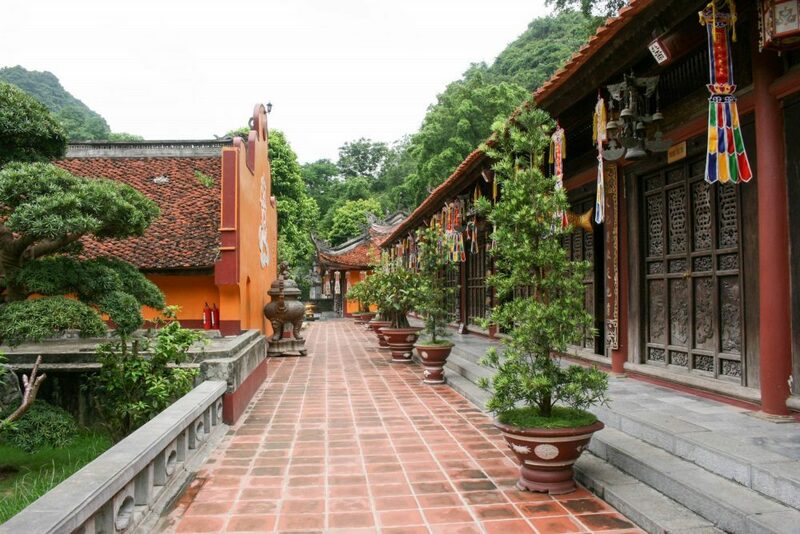 Click here for a complete detailed guideline for your next trip to Hanoi.